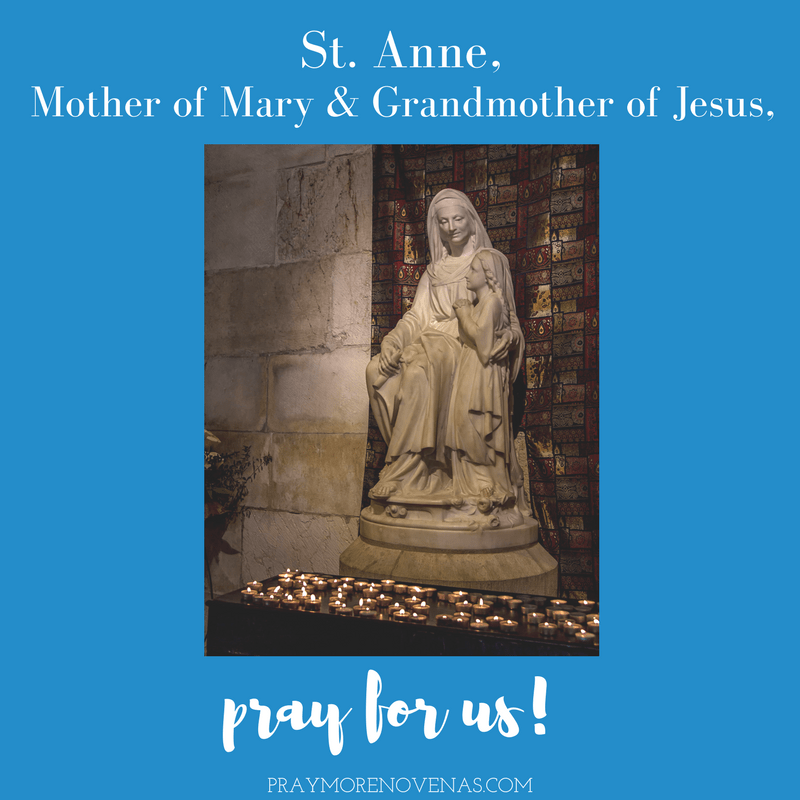 Here’s Day 5 of The St. Anne Novena! Please intercede and strengthen the relationship between my husband and myself. Ask God to show me what to do. I feel lost without my husband. Since he died, I work daily but miss him so much. No one will take his place with me. I need direction, motivation and a happy purpose. Pls also help me nephew Taylor. Ask God to send text his steps and help him become kinder to me. I love him. I pray for me and my husband and for all married couples which are represented in this novena. May Saint Ann and Saint Joachim intercede for us to be good spouses. Please intercede for me and my husband. Thank you for answering my prayers. May our Patience’s improved daily and our faith deepens. Jesus , I trust in you. May our finances improve. We pray for peace and in our families, and in the world. Pray for the protection of the family. Pray for our family members who have left the faith and stopped practicing Catholic traditions and values. Jesus hear our prayers. Dear St Ann, today I pray and thank you for letting me come and see Our Lady of fatima and lay my intentions to her.Please keep praying for me until my requests are answered.Please help my husband this coming week for his medical exam for his veteran disability.I also pray Dr Deboard will be guided and write a favorable report on him so he will be granted his hundred percent disability.I also pray for the other veterans Nazario,Agustin Alfredo be awarded their veteran disabilities.Please help Tracy with her problems regarding her boyfriend,I pray she will find a better one with your help and be a good mother to Jameson.Please help us with our BK and financial difficulties.Thank you St Ann.i will keep on praying until my requests are granted. Lord I pray for healing and to live a better life, I pray to meet the one you have chosen for me. Lord I pray that I will get a teaching position for the school year and be able to get closer to you. In Jesus name I pray . I pray for financial and academic success. I pray for my brother chibueze for spiritual healing of his illness Academic, health and long life for my siblings and parents. more grace onto the life of people I love. spiritual healing of my affected leg. I pray for my brother’s lotanna opt employment form for it to be replied this month. I pray also for my usmle step 2cs application to be approved this week and my job employment letter in my school should be verified and replied on Monday. This is what I asked through Christ our Lord. Lord I surrender all to you. Grant me your grace and mercy I prayer for all in Jesus name amen. St. Ann pray for us. Dear St. Anne i want to say thank you to your sweet daughter, my mother Mary for watching over my son and his wife, for saving them in the accident that they were involved in. Their car was destroyed but not their lives. Thank you so much for saving them. Lord I place my financial needs into your hands . I I pray for money to finance my son throughout medical school and to meet his other needs. I pray for money to pay his tuition fees. Good st Ann’s please intercede for me. Thank you Lord for my parents whose marriage was not always perfect but showed our family the love of God through their love of each other. They were blessed on earth and were soulmates. I know now that your marriage does not continue in heaven according to the book of Matthew however their love does. Thank you St. Anne and St. Jochum. I pray that God will bless my niece and her husband with a child as they are struggling with infertility. Prayers needed as I switch careers later in life. Prayers also as my son is starting his career path. Dear St.Anne &Joachim praying for my incoming nursing licensure exam on November 17 and 18..blessed me and help me to be the topnochers with the average of 88%..Give me more wisdom and knowledge I can answer my exam correctly…Give me more strength for my everyday life..Amen.. Please help us to get out of debt and my husband boss gives him an increase in pay.